Wilson Audio commemorates late founder with new Sasha DAW speakers | What Hi-Fi? 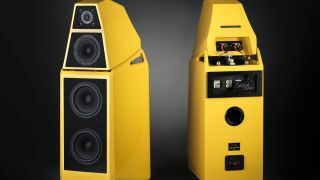 The Sasha DAWs (the ‘DAW’ standing for the late David Andrew Wilson, to whom these new speakers are dedicated to) are supposedly the largest upgrade in the history of the company’s Watt, Puppy and Sasha platforms. A new woofer has been designed especially for the mark two versions, based on the 8in driver in the Alexia Series-2. They use the two-driver configuration introduced in the original Puppy, which Wilson Audio claims to optimise both bass extension and speed and dynamics. To further augment bass performance, the Wilson Audio team has redesigned the Sasha’s bass enclosure from the ground up, increasing its volume by over 13 per cent and using thicker proprietary composite X-material panels. The blades on the top of the module (where the midrange/tweeter sits) now have openings that Wilson says reduces cavity pressure in the space between the upper and lower modules. The midrange and tweeters are the same units used in the WAMM Master Chronosonic, and they, with the woofers, are tied together with an all-new crossover. As with its bigger siblings, such as the WAMM and Alexx, the Sasha DAWs’ modular design allows the drivers to be specifically aligned for each installation so they can deliver precise timing. Hand-built in Utah, USA, and finished in Wilson Audio’s automotive-class paint facility, the Sasha DAWs cost £39,998 with a ‘standard’ colour finish, with premium ‘WilsonGloss’ colours available at £41,998. Custom finishes may also be ordered at £43,998. They’re expected to arrive in the UK in December.